Cakes shaped like Easter eggs are a delicious centerpiece for the spring celebration. Decorations can be as simple or elaborate as you have the time and skills to create, making these cakes a flexible option for all decorators. An Easter egg cake with polka dots and simple zigzag stripes highlights a traditional design that's simple to create. Crumb coat the cake with a thin layer of buttercream frosting. While allowing the crumb coat to set, dye buttercream frosting in assorted pastel colors as desired. Add a base coat of buttercream in your choice of frosting colors. Use a toothpick to create a zigzag design on the top and bottom of the egg. Be sure to carry it down the sides of the egg as well. Add the star tip to a pastry bag with coupler and place stars next to one another over the toothpick design. Wash the star tip and add to a pastry bag with coupler in a different color and add stars above and blow the two zigzags to create a two-toned design. Add the large round tip to a pastry bag with coupler and use to make random dots all over the egg. To do so, hold the bag straight up and down and release before pulling up so your dots do not have "tails" that stick up. If they do, use your finger to lightly smooth them down. Wash the round tip and continue making dots with other colors until you reach the desired amount of polka dots. Fit a pastry bag and coupler with the grass tip and green buttercream icing. Add grass to the bottom of the cake to serve as the border. A 3D cake that is elegantly decorated will look lovely in the center of your Easter table. The pans are available through craft and kitchen stores seasonally, you can pick up a discontinued cake pan on eBay, Amazon, or other sales website, or borrow one from the local library or a friend. 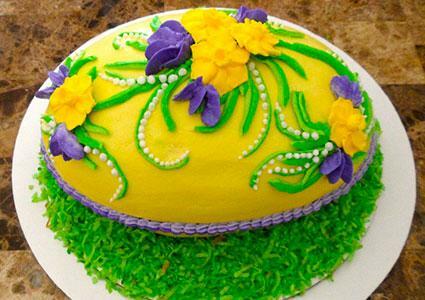 The day before you plan to decorate the egg cake, make five or six royal icing daffodils using the petal decorating tip, flower nail, and flower former following daffodil directions from Wilton. Allow them to harden for approximately 24 hours before using them on your cake. Use buttercream frosting to secure the two sides of the shaped egg cake together. Cut the bottom a little flatter if it does not sit still when placed on your cake board. Once the crumb coating has set, add a layer of buttercream frosting in your desired color and smooth. Decide where you want to place your daffodils and use green buttercream frosting in a pastry bag with round coupler to create long stems and leaves that spread outwards from where you plan to place your daffodils. Add a slightly lighter color of green to a pastry bag with the round tip and add accents to the larger leaves. Carefully place the dried daffodils on the cake. Use the petal tip with lavender or purple buttercream frosting to create sweet pea petals next to the daffodils. Add a round tip to a pastry bag with coupler that is filled with white frosting. Add decorative dots along some of the green stems to create an elegant look. Replace the petal tip with the star tip on the pastry bag filled with purple buttercream. Create a border around the seam of where the two cake halves meet to hide any imperfections in the original coat of frosting. Tint shredded coconut with green food dye and add around the base of the egg cake to resemble grass. A pretty cake is sure to end any meal on a special note, but when it is shaped and decorated to resemble the Easter holiday, it's even more special. 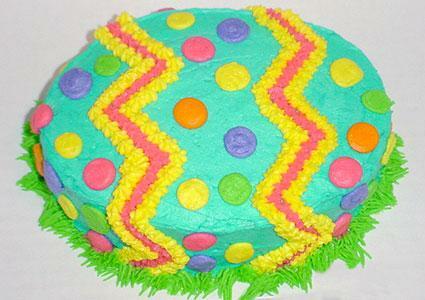 Use your favorite colors to create a cake that matches the rest of your Easter decorations.